As the second Unite the Right rally took place in Washington, those in Charlottesville remembered Heather Heyer who died last year. WASHINGTON — The hundreds of counterprotesters who congregated in Lafayette Park on Sunday, just steps away from the White House, dwarfed the fewer than 20 people who showed up for the second Unite the Right rally, a gathering aimed to bring together multiple white nationalist organizations. In total thousands took to the streets to protest the group's presence and purpose. Jason Kessler, the white nationalist organizer of the Unite the Right rally, was accompanied by a few dozen people when he arrived at the Vienna, Virginia, subway station at about 2 p.m. ET. There they boarded three train cars and went to the Foggy Bottom stop in Washington. But when they arrived, their number appeared to have dwindled to fewer than 20 individuals — though Kessler acquired a permit that allowed for up to 400. The entire event appeared haphazard, disorganized and did not carry a clear message. First it began well before the intended 5 p.m. ET start time, then organizers decided to depart early when it started to rain across the nation's capital. Thelmiah Lee, 67, said he was also proud to see a diverse swath of people willing to stand out in the rain for as long as they had to. “They shouldn’t have bothered showing up,” he said of the Unite the Right rally. A year ago, hundreds of white nationalists and anti-fascist counterprotesters clashed in Charlottesville, Virginia, during the first Unite the Right event — or "white civil rights rally" — that Kessler organized. Heather Heyer, 32, a civil rights activist, was killed when James Alex Fields Jr. plowed through a crowd of counterprotesters on Aug. 12 of last year. Members of Kessler’s group told journalists at the Virginia metro station that they were a “tool of the Zionist media.” With their faces covered, the Unite the Right rally attendees also announced that they were the “founding stock” of the United States and claimed they were more American than non-whites. Most kept their faces covered with large American flags and declined to give their full names when approached by members of the media — far different from last year's very open display. When Kessler's group finally arrived at 3:30 p.m., fewer than 20 people remained. They were greeted by counterprotesters shouting, "Nazis, go home!" and "you are not welcome here!" A few rallygoers waved at the counterprotesters nonchalantly, earning jeers from the much larger crowd. The police held a line between the white nationalists and the counterprotesters, who were separated by fences and about 50 feet of grass. When an emcee told the counterprotesters in Washington that Kessler had boarded a train from Virginia and was on his way to the city, many began to boo. Meanwhile, dozens of people associated with the racial activist group Black Youth Project 100 marched on H Street, shouting, "Fight back, rise up!" as police blocked off the road to traffic. Brandon Watson, 28, of Bristow, Virginia, stood with Kessler and called him a friend. Watson said he came as a black man and supporter of civil rights for everyone else. "If someone has a lesser right than someone else, then we're not united," Watson said, claiming that Kessler was "here for everyone." But those at the counterdemonstration in Lafayette Park said they were pleased to see the protests so far were peaceful — and hoped they'd remain that way. "I don't want to see any violence. This is my city," said Washington resident Alby Gyimah-Boadi, 32. "I'm here because I simply want to stand up for my rights and who I am. [White nationalists] have always had them, so for them to act as if their rights are under attack now, it's wrong." Rain soon overtook Washington and it appeared to cut the rally short, but it did not appear to dampen the spirits of the counterprotesters. When Kessler and his band of white nationalists attempted to depart Lafayette Park, starting and ending the event early, they found their route blocked by anti-fascists and other counterprotesters who yelled, "It's hot. It's wet. We aren't done with the Nazis yet." 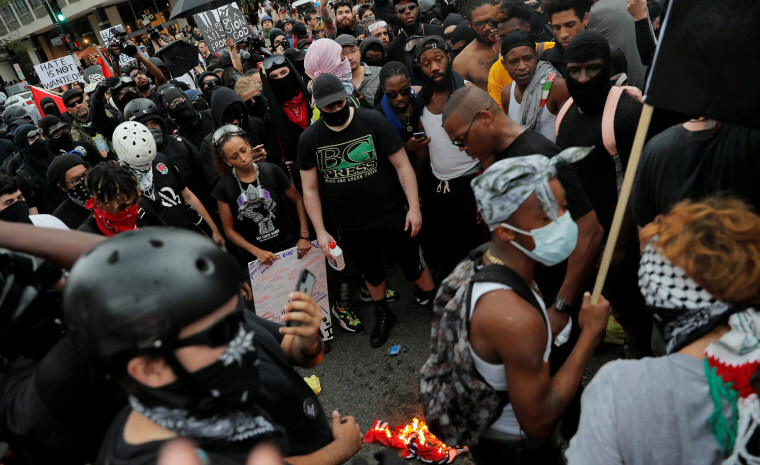 Anti-fascists threw bottles at and scuffled with police officers, as the anger over a disorganized white nationalist rally continued to ripple through the streets of the nation's capital even after the group of white nationalists had left. Meanwhile, in Charlottesville, dozens of people gathered to pay respect to Heyer and carry out a memorial on the street where she died, which also now bears her name. People laid flowers and signs that said "LOVE." Heyer's street was covered in chalk drawings and phrases of support. "You're not going to be relieved through grieving or other mourning, but you have to put it in perspective that there is still a fight and you have to continue that fight." Early in the afternoon, Heyer's mother, Susan Bro, arrived to commemorate her daughter's memory. She laid flowers for her daughter, as well as the two police officers who died in a helicopter crash nearby on the same day. The crowd sang and Bro hugged other community members before departing. Video from the 2017 rally showed officers standing and watching as people were beaten, and a scathing independent report released in December found multiple failures by Charlottesville city officials and police. A total of four people were arrested by Virginia State Police on Sunday. After a woman confronted a man who had stopped by Market Street Park and saluted the Gen. Robert E. Lee statue there and the two began to fight, both were arrested for disorderly conduct. One demonstrator spat in another's face and attempted to cling to another protester when a trooper took her into custody. She was found to be in possession of a metal baton. She was arrested on charges of assault and battery, disorderly conduct, obstruction of justice and possession of a concealed weapon. A Charlottesville man was arrested when he attempted to block a police motorcycle unit who were providing safe passage to a group of demonstrators. National guardsmen, armored cars and additional police soon arrived on the scene as billowing gray clouds began drizzling lightly on the crowd. Thunderstorms were expected in the region, but people stuck around Heyer’s memorial and continued to discuss the importance of the moment. Later, hundreds gathered at the Sprint Pavilion in Charlottesville for a worship service. One Charlottesville resident and Black Lives Matter activist at the memorial, Rosie Barker, 46, said she was two feet from Heyer when the young woman was hit by Fields' car, and she described it as something that plays "over and over in my head." "I came here today for a healing, for a cleansing," she said. "You're not going to be relieved through grieving or other mourning, but you have to put it in perspective that there is still a fight and you have to continue that fight." Erik Ortiz reported from Washington; Daniella Silva from Charlottesville, Virginia; and Phil McCausland from New York.